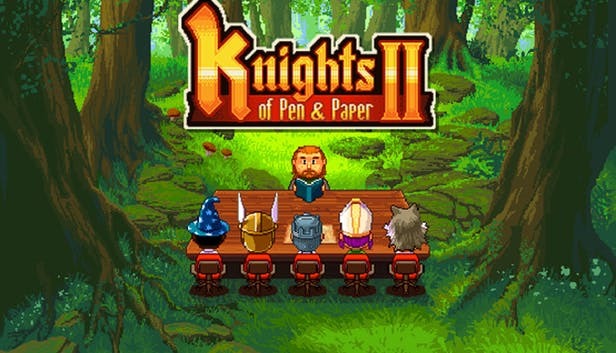 Knights of Pen & Paper 2 looks like a “cute” game but it has lots of “serious” mechanics. If you are new to dice-rolling RP games, you will need all the help you can get. This is why we are here: Below, you can find the most useful tips and tricks that will help you in your adventures. Do Not Wander On Map Aimlessly. 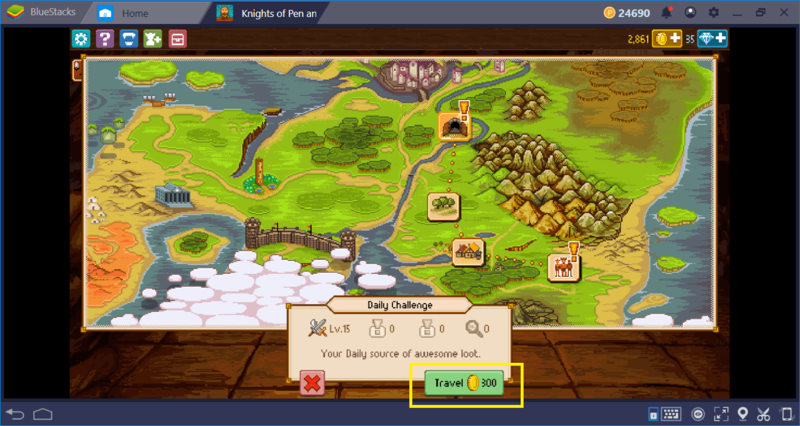 Knights of Pen & Paper 2 will ask you to travel on the world map constantly: Almost every quest is located in a different zone and you need to switch between these zones frequently. Thing is, traveling on the world map costs at least 100 gold each time. And for remote locations, this amount can be much higher. This will be a problem, especially at the beginning when your gold stock is low. And it will keep being a problem even at later levels, because lots of remote locations will become available on the map. You don’t want to spend your hard-earned fortune just for traveling, right? Therefore, make sure to complete every quest in an area before you are heading to another – never “half-complete” your missions. In fact, try to grab every quest in a specific area before going on to your journey and make sure that no quest left behind. Otherwise, you will keep spending gold just to go to the places you already visited. Remember To Get Your Free Chest. 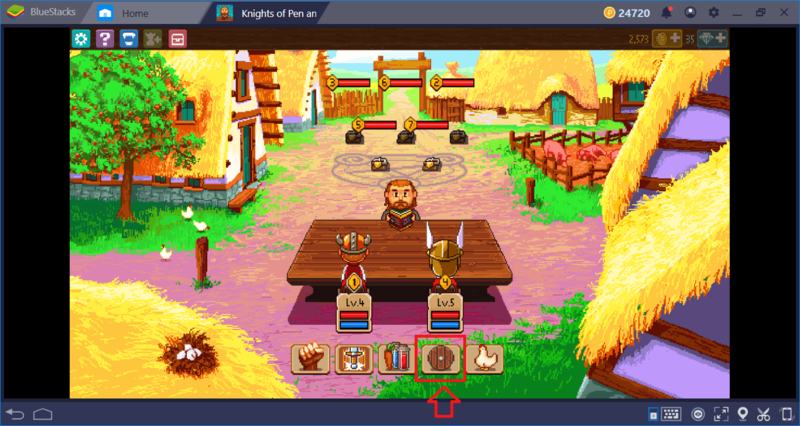 Knights of Pen & Paper 2 is a free-to-play game, which means it also uses loot crate mechanics. You get to open a free crate every 18 hours and purchase others with real money, if you want to. 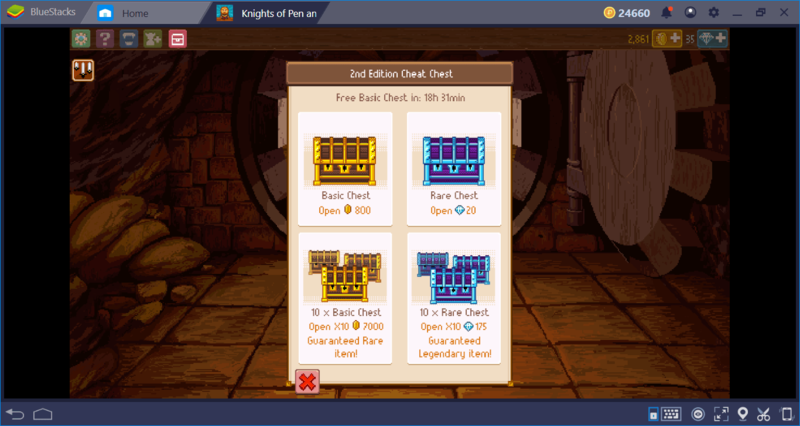 There are two types of chests, basic and rare. They both award the same things (combat buffs and items) but the rare chests are more generous when it comes to items, while basic chests award more buffs. This is not a problem though: The combat buffs that come from basic/free chests are quite powerful. In fact, they can make your party incredibly powerful for a short period of time. Therefore, opening these free crates right before entering a challenging battle will be a good idea. The buffs you get will make your job easier than ever. This is the buff we got – for 9 minutes, we are basically living gods. There Are Other Ways To Replenish Your Health. Using potions and food are not the only ways to replenish your health and mana points. In fact, use them only during battles and only in true emergencies – use the cleric or paladin in your group for healing the party members as long as possible. And once you finish fighting, use one of these two options to replenish your lost points: Camping or sleeping. Both options have advantages and disadvantages, but both are free. 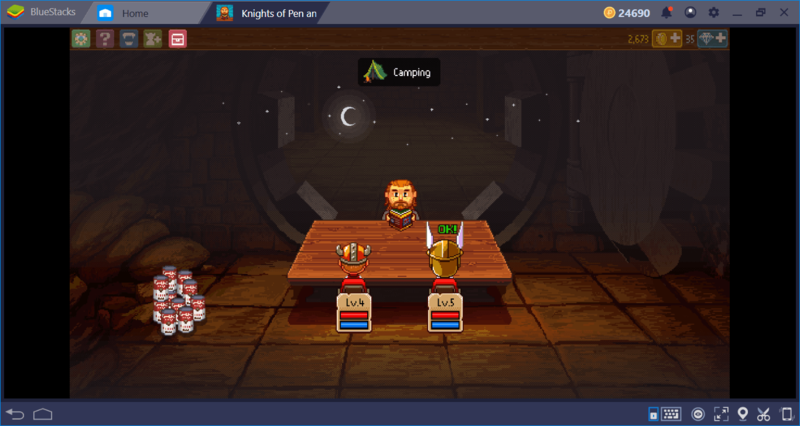 Resting in an inn will replenish all of your health and mana points. The problem is, you need to be in a town to use it. You don’t need to be in a town to use camping – the other way of restoring lost points. You can camp anywhere you like but this option is tied to roll. If the roll is not in your favor, you will be ambushed during camping and forced to enter another fight. If one of your heroes is taking a heavy beating and about to die, you can use a special feature to survive a little longer: taking cover. This mechanic drops the threat to that hero to 0, which means the enemies don’t attack him/her until the next round. This will be especially useful if you have a hero that has very low health points but about to activate its special attack. Take cover, survive the turn, and attack in the next: You get one more chance to live. 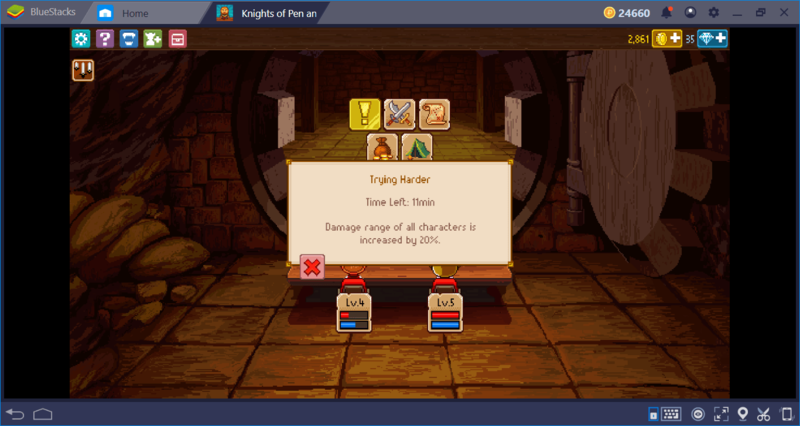 Take a look at our Battle System guide for more tips on combat. This is the button you need to press for taking cover. Knights of Pen & Paper offers a very detailed Bestiary which you can read anytime you want. You gain information about enemies as you kill them: The more you butcher, the more informed you are. This is not just a simple glossary: Bestiary contains very useful information about your enemies, such as what type of attacks they are vulnerable to. This information can save your life especially when fighting against challenging enemies – for example, you can decide to add a paladin to your team because the enemy is weak against its attacks. Check the Bestiary often and make sure you have the best team setup available. 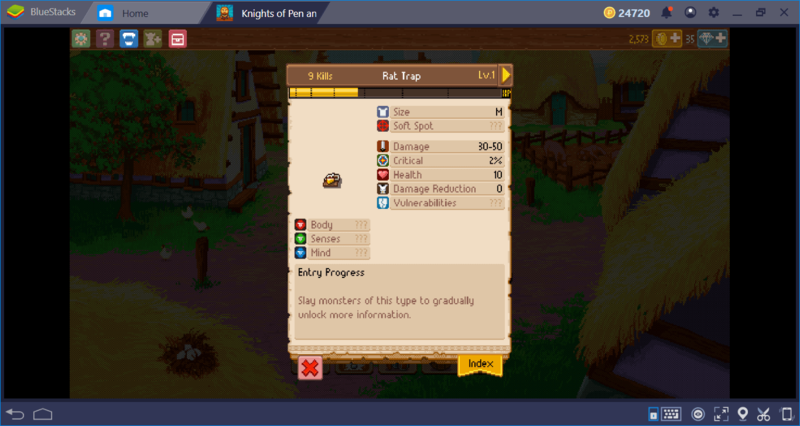 Well, hero, we now believe that you are ready to face the dangers in the world of Knights of Pen & Paper 2. However, in order to be completely ready, we highly recommend reading our other guides too, especially the one about BlueStacks advantages. You need all the help you can get and we are here to be your faithful guide: Ciao!